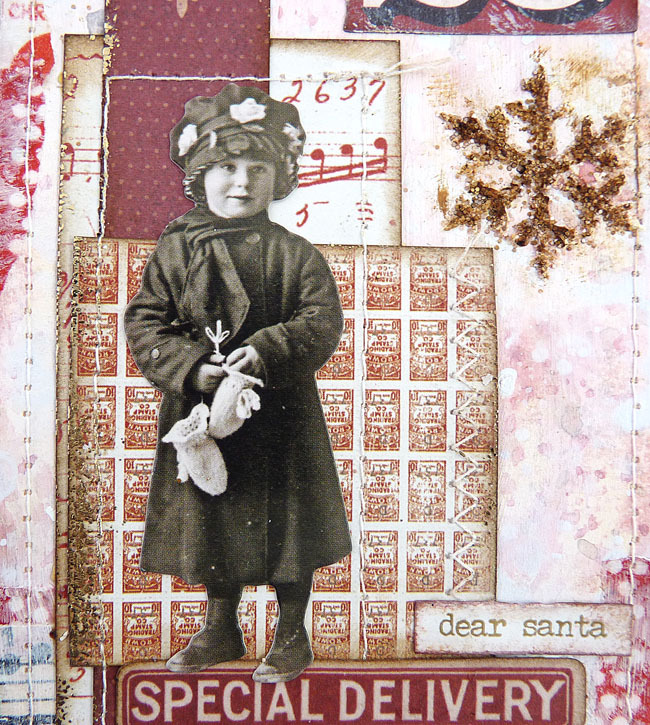 It's another Tag Friday at A Vintage Journey and I am really starting to get into Christmas mode. Here's my sample for today. 1. Lightly paint tag with white gesso leaving some of the card showing through. 2. Using decoart media fluid acrylics mix a couple of watery colours and then dip and dry to create your first layer of colour. (I used raw umber and quinacridone red). 3. Repeat step 2 using titanium white to achieve a mottled effect. 4. Tear some tissue tape strips and add and lightly dry brush some gesso over them. 5. Machine stitch around the edges. 6. Mix some white modeling paste and white gesso together (approx half and half) and with a palette knife scrape it through a stencil, add some coloured distress glitter and leave to dry. (See Tim Holtz Holiday Hacks videos for a do it yourself hack). I used a coloured glitter that really didn't look right so out came the raw umber painted and they got painted. 7. Dribble a watery wash of a darker colour around the textures and dry. 8. Gather together collage elements including ephemera, metal embellishments, some die-cuts, words and paper doll. 9. Put the background layers of the collage together and glue them to each other. Add some machine stitching and then some foil to the edges. (I used versamark, sticky embossing powder and foil sheets). 10. Adhere the collage to the background, add the paper doll, embellishments and words. Sometimes I plan out my steps before I start and have an idea of where the collage is going to go but as I make up my designs I will often change them as I go along. When adding collage layers sometimes I will just layer and glue straight away, other times I might make up the collage as a separate element before I then add it (which is what I did on this one). It gave me the opportunity to add more stitching before I glued it down. I made sure I knew where the collage was going on this design before adding the stencilled texture so that I only added it in the gaps that needed something extra. So if you are looking for some tag inspiration please pop over to the AVJ post today to see the wonderful creations the team have come up with. You won't be disappointed. A beautiful collage background with that vintage image. 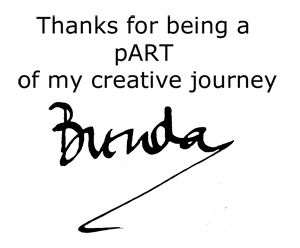 Lovely, Brenda! Delicious warm colours with a touch of frost, and perfect vintage collaging. She's adorable... hadn't spotted her yet. This tag is simply gorgeous! I love thos details and the overall look ist artsy! BRILLIANT! 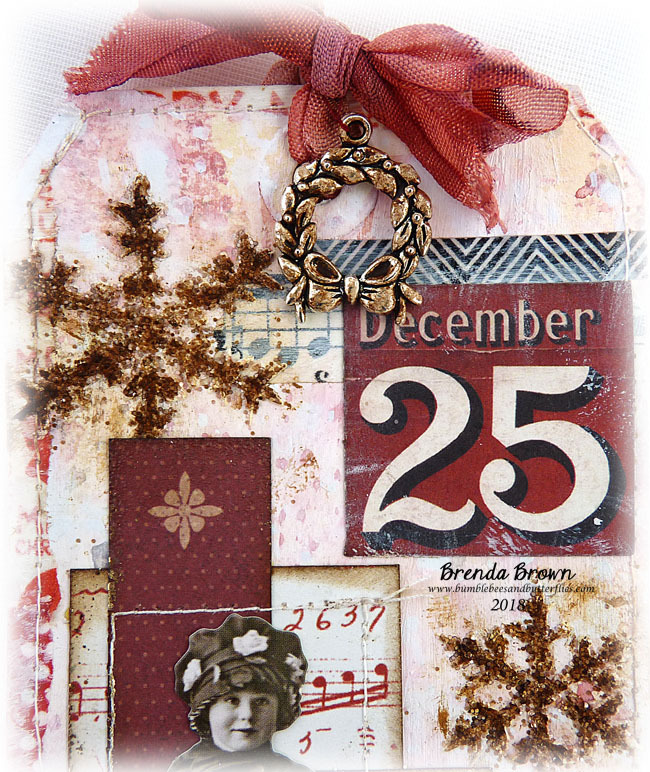 A fantastic festive collage tag Brenda, super additions. Fabulous multi-layered tag Brenda, great colours and love the addition of the stitching!! A lovely collage of patterns and stenciling Brenda, the snowflakes are so sparkly with the addition of glitter! Oh, my! 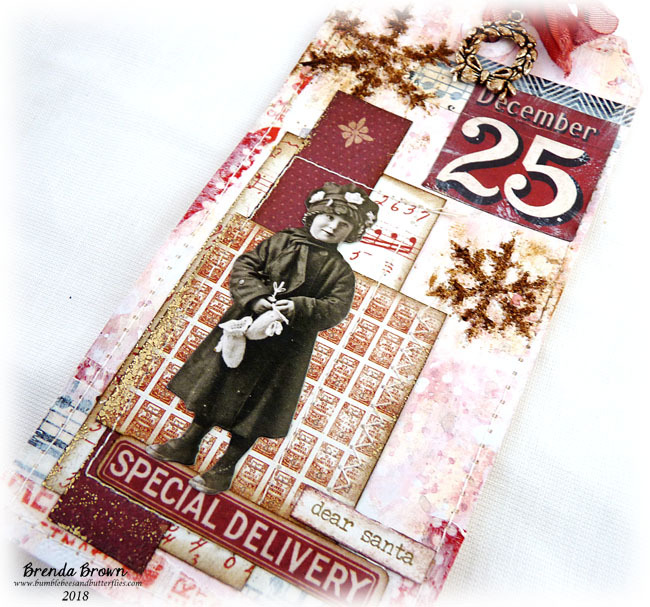 Brenda, this is a beautiful vintage tag and as always, your collaging is enviable! Every single elements plays so perfectly with each other! I'm really happy to see you using a new Paper Doll. I haven't seen many of them being used this season, but then I don't 'get out' much! Merry Christmas! 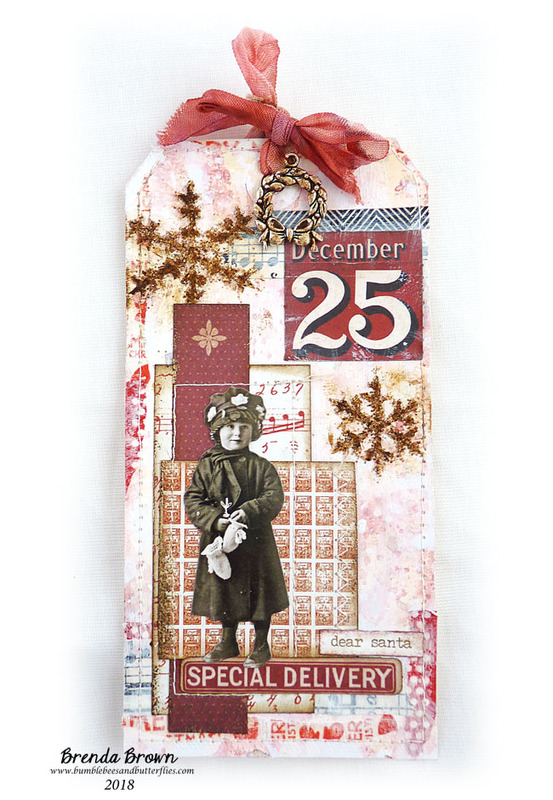 Love your Collage beauty and that precious paper doll.. Haven't seen her... Beautiful Christmas tag! Adore your tag, Brenda. Wonderful design and faultless execution. A tag that holds a lovely touch of Seasonal charm .